Lush tropical gardens transport you to a world of romance where no building is higher than the tallest palm. Arbors of aromatic blossoms sweeten your days and nights, and the brilliance of Caribbean colors burst forth painting a backdrop of astounding beauty. 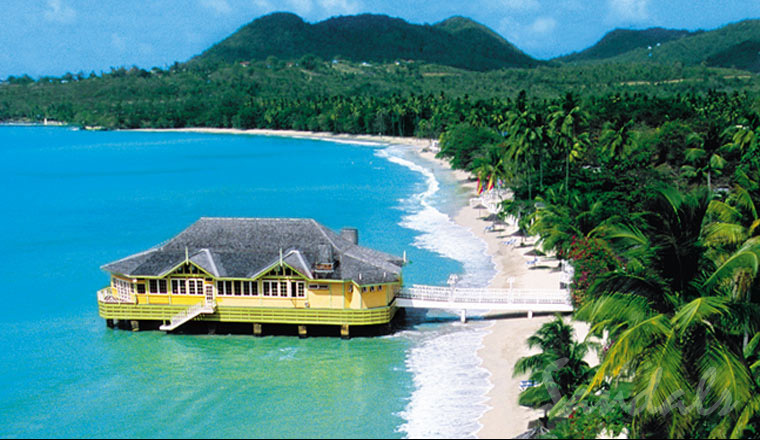 Dramatically extending 130 feet out over the water, you’re cantilevered over the sea, savoring Caribbean cuisine. The freshest seafood infused with island fruits and spices is enchantingly enhanced by the spellbinding sight of colorful fish in translucent waters. Of all the Sandals resorts, it has been said that perhaps Sandals Halcyon Beach best defines the Caribbean’s Caribbean—set on a palette of lush gardens bordering the tranquil Caribbean Sea. By design, the resort is built naturally into the environment with no building higher than the highest palm. Classic Caribbean architecture and quaint, charming ginger breaded cottages are creatively designed to meld into the luxuriant sorrounding landscape. Lazy swims in the secluded lagoon pool (one of three), seductive strolls among birds of paradise and brilliantly shaded trees, and an unwavering sense of “No worries, Mon” brings your fantasy island to life. Indulge in the island’s most impressive dining experience at The Pier—dramatically extending 130 feet out over the water. It’s just one of four restaurants and seven bars, plus with our dine around program there are seventeen additional restaurants at the neighboring Sandals Resorts. With a spellbinding backdrop of verdant mountainsides reminiscent of exotic Fiji, your senses awaken. This is quintessential Caribbean, and you are about to surrender to a world of enchantment and the ultimate island state of mind. 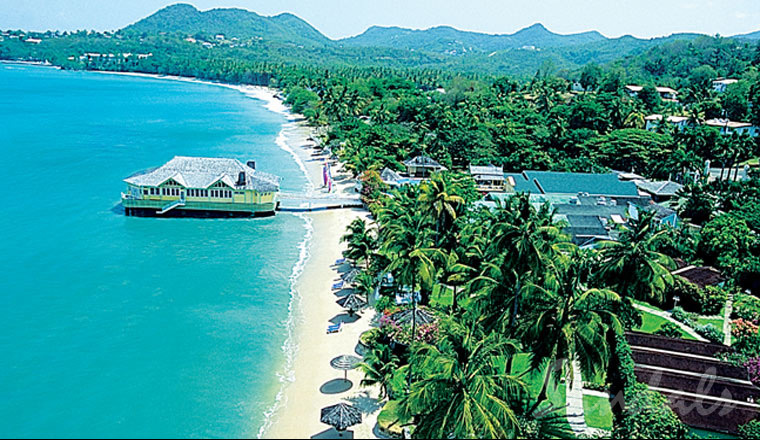 Sandals Halcyon Beach Resort approximately 10 minutes from Vigie International Airport and 1 hr. 15 min. 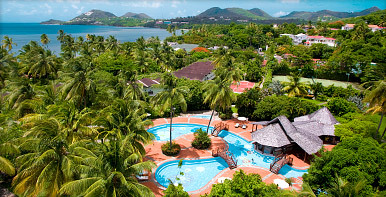 from Hewanorra International Airport, Sandals Halycyon Beach St. Lucia is also only 15 minutes from Sandals St. Lucia or Sandals Grande St. Lucian. Rooms are cottage style, in rows, with outside entrance. All rooms are the same size. 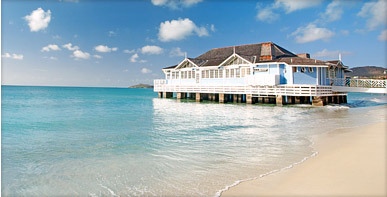 Only at Sandals can you stay at one resort in St. Lucia and enjoy full exchange privileges at all three. Courtesy shuttles are provided to and from each of the properties. As part of the prestigious Signature Spa Collection, you can opt for the ultimate indulgence of a full-service spa (Spa services are not included). This resort does not offer a suite category but offers newly introduced Butler serviced top room category. Twinsburg Travel & Cruise Inc.